The firm deodorant of Crystal much safer, more compact, more economic and is more convenient in application, than a usual deodorant. In what its secret? Today disputes on harm of usual antiperspirant deodorants because of the content of aluminum hydrochloride in them are often conducted. Scientists are concerned by penetration into an organism and accumulation of dangerous radicals of aluminum in a liver, the kidneys and a brain capable to lead even to breast cancer. 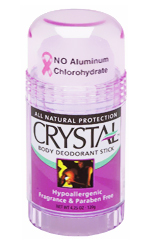 Absolutely safe and environmentally friendly alternative to traditional industrial deodorants is the deodorant crystal. There are already very many kinds of crystals at various producers, but a basis at all identical - natural mineral salt. Crystal forms a thin invisible protective film on skin which will reliably and effectively protect you from smells during the day. 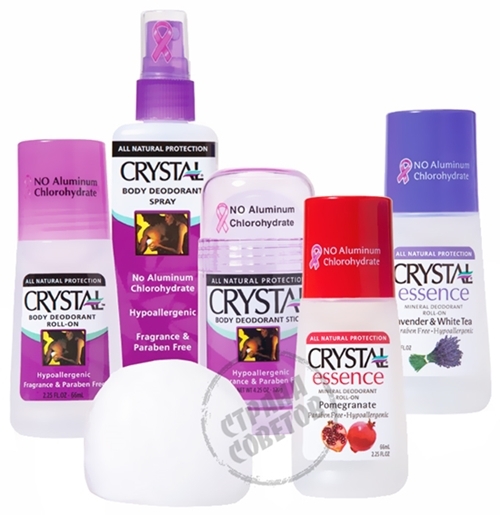 It is important to understand that the deodorant of Crystal does not eliminate sweating, it eliminate the unpleasant smells caused by sweating. Minerals suppress reproduction of bacteria which are the reason of emergence of an unpleasant smell. The crystal does not contain alcohol, fragrances, dyes, parabens, preservatives, does not cause an allergy, does not stick to clothes, does not leave spots on clothes and completely washes off. Therefore it is ideally suited for skin, sensitive and inclined to an allergy. Equally is suitable for women and men. Thus depending on the size it lasts for long months, and even years. Structure: the deodorant crystal is made of 100% of natural mineral salts - POTASSIUM ALUM (alyumokaliyevy alum). Application: the deodorant crystal is very simple in use - slightly moisten Crystal with water and apply it on pure area of armpits for full protection against an unpleasant smell during the whole day. NB: Except rescue from unpleasant smells, the crystal can be used as a disinfectant at cuts or stings of mosquitoes, previously having moistened salt with water.